That extract from Michael Mott's authorised biography of Thomas Merton describes the meeting in October 1967 between Trappist monk, peace activist, poet and author Thomas Merton and composer John Jacob Niles. The first set of Niles-Merton Songs, op. 171 was completed in June 1968. Thomas Merton visited Boot Hill Farm for a second and final time in 1968. During that visit he heard the op. 171 songs and discussed with John Jacob Niles the poems to be set for the second set which were to become op. 172. On 15th October, 1968 Thomas Merton flew from San Francisco to Asia to represent Christain contemplatives at a conference of Asian monastic orders. Having delivered his address in Bangkok on 10th December, 1968, the 53 year old Merton returned to his room in the retreat centre and died by accidental electrocution. John Jacob Niles was devastated by Thomas Merton's tragic death and this influenced his choice of poems for the second set of songs. The mood is blacker, and the twelve songs in the op. 172 set include Merton's best known poem 'For My Brother Reported Missing In Action, 1943', written in memory of the poet's younger brother who died in the Second World War. The complete cycle of Merton-Niles was first performed in 1975 at the University of Kentucky Newman Centre, and they were published in 1981. 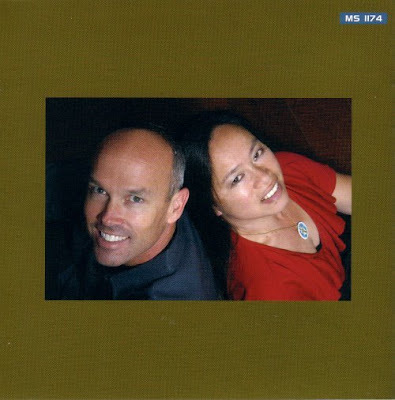 In 2005 baritone Chad Runyon, accompanied by Messiaen specialist Jacqueline Chew (seen below), recorded the complete Niles-Merton Songs for MSR Classics in a version transposed for the lower voice. As we mark the fortieth anniversary of Thomas Merton's untimely death we are very fortunate to have such an outstanding recording of these settings. 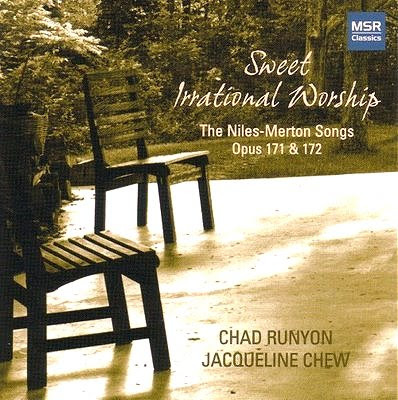 Chad Runyon delivers the texts with exemplary musicality while Jacqueline Chew's accompaniment makes a passionate case for these little-known gems. The sound is first class, as are the sleeve notes by Jody Black, while the striking sleeve, shown above, uses photography from Harry L. Hinkle's excellent photographic essay Thomas Merton's Gethsemani: Landscapes of Paradise. Listen to audio samples of the Niles-Merton songs here. Wonderful words and wonderful music. But, forty years after his death, what is the relevance of Thomas Merton? Ten days ago James Finley, a student of Merton's from his time at the Abbey of Gethsemani, visited Norwich Cathedral to give a talk on his teacher. It was a wet and windy November evening, yet the nave of the great Norman Cathedral was packed. Hearing a Buddhist prayer ring out as James Finley led his audience in silent meditation in this centre of Christian worship was moving beyond words. Today, the contemplative movement pionered by Thomas Merton is gathering momentum as it crosses boundaries of faiths and age, as my visits to Taizé have also showed. Thomas Merton's poem To A Novice has already featured here, as has his novel My Argument with the Gestapo. Merton is set into the wider cultural context of the 1960s in Karlheinz Stockhausen - part of a dream.